This article is about Achaean Greek. 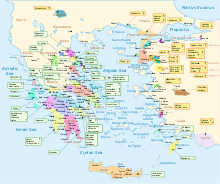 For the later dialect used in Achaea and the Peloponnese, see Achaean Doric Greek. This article contains text in the Linear B syllabic script and characters used to write reconstructed Proto-Indo-European words. Without proper rendering support, you may see question marks, boxes, or other symbols.